Our tears are the truest thing about us most days so we best let them speak when the opportunity arises. Today, we are surrounded by horrors. Whether those horrors are measurably increased from the horrors of other ages or if the ubiquitous nature of our mediated environment are simply bringing them to our attention matters little. We have the very real sensation that the world is coming unglued around us. Hurricanes roll across battered sands, earthquakes tear poverty-stricken streets from their moorings. We awake to another shooting, another threat of violence on some distant shore and some days our own. And of course, there are small intrusions as well. We suffer death by a thousand cuts of bitter words on Facebook, vitriol from our leaders, callous glances from our co-workers, a steady and inexplicable inability to be heard in a world full of noise. In small ways and large, we live in an age of wars and rumors of wars. Most of these are cold wars as time has taught us that we can punish our enemies more effectively by passive-aggression. We shut each other out and surround ourselves with bubble-wrap and steel and one more delivery from Amazon in the hopes that we can quell the violence we feel toward ourselves and the indescribable “other” who seems to be pounding at our door. We are alone within and without. Filled with projects and performances, posts and prescriptions, all the human places within us filled in with everything but that which makes us human. Even as we a jam-packed with saccharine and screens, the joy sneaks through. Of course, they were in no way messing with my life. They were trying to navigate their own. Two single moms, a grandma, and six elementary-aged kids, seats scattered across 4 rows with no more than two together at a time. One of the mothers was supposed to be in my row, but she was busy getting everyone else seated. Truth be told, it was quite the dramatic affair which ended when one of the boys was left sitting alone in a row leaving him in tears. Mom was set to be in the window seat in my row, and the man in the middle gave up his seat so Crying Son could sit with mom. The drama which I at one point could at a distance judge, was now sitting right beside me. I was filled with all the usual judgments. What is wrong with people who don’t know how to login to united.com and pick their seats, how can they not know how to do this? Why can’t this woman get it together? Why didn’t they have a plan for this? Three adults and six kids is a manageable ratio, figure it out! Today was my fourth trip in as many weeks. Last night I landed from one destination, slept in my bed (thank God), and got up to leave for the next go around. For me, navigating my life today meant bearing down and leathering up. Trying my best to shut out the world around me for fear that one more thing would creep in to overload my already overloaded mind and heart. I did not have time for airline novices. Who has time for airline novices? But we are all navigating our lives. We are all mazing through the bombs going off around us and the destinations we are headed to. We are all trying to find our seats and draw near to those we want to protect or who we hope will make us feel at home. We all are silencing the rumors of wars. And even still, the joy cracks through. Thankfully she was gracious with my intent and went on to tell me how they had tried yesterday to preselect seats to no avail. We swapped horror traveling stories and reminded each other how the best people in the world find ways to act terribly on planes. I am far from the best person in the world, but I am quite skilled at acting terribly on planes. We constant business travelers have ready access to the armor of self-importance and condescension. Her friendliness and steadfastness in the face of a difficult scenario disarmed me. Reminded me of the humanness which hides just behind the face of a stranger. I am so used the war that I was all armored up. I got lucky that grace grabbed me just in time to let the joy crack through. The conversation faded and we went to back to the standard front-facing strategy of plane-riding. 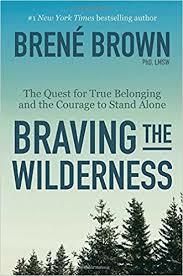 I put on my headphones, a disappeared into Brené Brown’s latest book, Braving the Wilderness. I have learned a lot from Brené and have been so grateful for her voice in today’s noisy and warring world. Her previous books dovetailed with other material I had read, but I’ve never had that “hit you between the eyes” moment reading her, like so many others have. I turned to Chapter 6: “Hold Hands. With Strangers.” The chapter goes to great lengths in describing the psychological importance in finding solidarity with others, through music, through sports, through art, through national tragedy. What the Bible calls weeping with those who weep and celebrating with those who celebrate. I am generally anti-stranger, but given my experiences 30 minutes earlier, I couldn’t help but notice the synchronicity. Brené, like me, is a Harry Potter fiend and she went on to describe the moment when she sat in the theater for “Half-Blood Prince” and watched as Harry faces the loss of his father-figure, Dumbledore. As all of Hogwarts surrounds his fallen form, Dame Maggie Smith’s character, Professor McGonagall, holds up her wand to the sky and small light emits from its tip. Dozens of students and teachers follow. It is arguably the most poignant moment in the series of films (among many competitors). At this point the tears are rolling down my face. Big ole alligator kind. My shirt collar is moist. I don’t care. I have always felt a palpable connection to the loneliness embedded in Harry’s story. Though he is surrounded by friends, within himself there is a burden he must bear. The burden of his unique losses, the burden of his calling, the burden of all that winds and unwinds him. His companions are often signs of comfort, but there is so much of the journey that Harry must, in his most central self, do alone. He is a young man acquainted with tragedy in an uncommon way. It would be easy for him to leather up and steel-toe his way through life. But the beauty of Rowling’s storytelling is most poignant in Harry’s journey to honestly incarnate his sadness and anger, face the wars and rumors of wars, and in the long-run let the joy seep through. He finds a home within the walls of his own story. Through this homemaking, he is finally free to stand in solidarity with all who’ve loved him all along. We are all in the wrong seat on the plane. We are little boys looking for our moms and instead stuck next to strangers. We are boy wizards watching our heroes die. We are all fighting for our lives and wondering what all the fighting is for. We are all uniquely alone until we see that our aloneness is perhaps what makes us so together. Our tears are the truest thing about us most days. They are equal parts symbolic of our deepest joys and deepest pains, which in the final analysis are often two sides to the same thing. We are always so close to the weapons. Attacking strangers for not knowing where their seats are. Lashing out on Twitter. Focusing all our “likes” on the most divisive and vitriolic of articles on Facebook because they give us a sense of belonging that someone else is as pissed off as we are. Gossiping about neighbors and coworkers. The wars and rumors of wars are always at our finger tips. “We Believe in the Light.” All of us. And the Joy Sneaks Through.